The Gospel of Matthew was written to a group of Christians who didn't yet know who they were. They were faithful Jews in the synagogue community in Galilee who had found the Messiah. Jesus had changed everything. But how should they think of themselves now, as Jewish or Christian? What did it all mean? Matthew writes his Gospel to help his readers define their new identity as followers of Jesus the Messiah. Michael Card unpacks how Matthew's emphasis on fulfillment confirms their Jewish connection to the Torah, while his focus on the kingdom helps them understand their new identities in Christ. Matthew presents this process of redefinition as an exercise of the imagination, in which Jesus reshapes who we are in light of who he is. 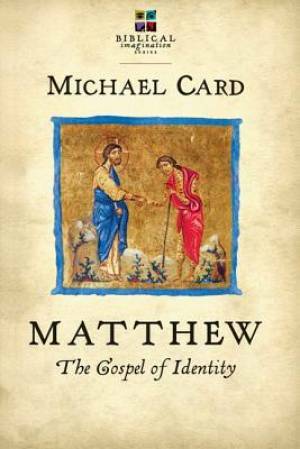 Matthew: The Gospel of Identity by Michael Card was published by IVP (USA) in March 2013 and is our 12830th best seller. The ISBN for Matthew: The Gospel of Identity is 9780830838127. Be the first to review Matthew: The Gospel of Identity! Got a question? No problem! Just click here to ask us about Matthew: The Gospel of Identity.